Siliguri mayor Asok Bhattacharya today alleged an "economic blockade" by the Mamata Banerjee government and threatened to hit the streets of Calcutta if funds were not released to the municipal corporation. 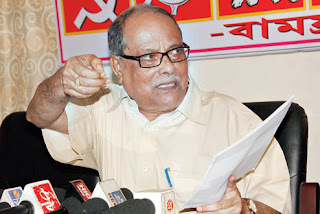 He told a news conference here this afternoon that urban development and municipal affairs minister Firhad Hakim had adopted a "vindictive and hostile" attitude towards the Left-run Siliguri Municipal Corporation and the Siliguri Mahakuma Parishad. "This is an economic blockade, unprecedented in Bengal. The state is withholding the approval even for projects where no funds are necessary," said Bhattacharya, who was the urban development and municipal affairs minister in the erstwhile Left Front government. The mayor said a mahamichhil (grand rally) would be held in Siliguri on Friday, followed by a demonstration in front of the Siliguri Jalpaiguri Development Authority office "to protest the economic blockade of over Rs 100 crore". He said civic bodies run by the Trinamul Congress were given funds by the government in several categories. "We want to give a memorandum to the governor next week and write to Union urban development minister (M. Venkaiah Naidu). If everything fails, we have plans to block the streets of Calcutta and stage a demonstration in front of Hakim's office," Bhattacharya said. According to him, repeated pleas to meet the chief minister have fallen on deaf ears and her office has persistently denied him an appointment. Every meeting with Hakim, Bhattacharya alleged, ends with "false" promises of sanctioning funds. Hakim sought to rubbish Bhattacharya's charges and challenged him to provide evidence substantiating them.